Set in 1848 California. About a brother and sister battling a crooked businessman over property rights. 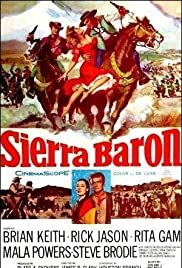 In this Western, Alan Ladd exacts revenge on a small town the best way he knows how -- by becoming sheriff. Frustrated with the lack of opportunities in his hometown, young Jess Harker plans to leave, but sympathetic stagecoach armed guard Race Crim persuades his boss to give Jess the stage driver job. At the end of WW2, aboard a repatriation ship, an Army doctor reminisces about his war years while being interviewed by a reporter. Apaches surround and attack a remote stage relay station trapping a stagecoach, passengers, cash box, a local bandit, a drifter and the station staff in a search for a killer of their tribesmen. Old California's Bloodiest Battle for Power! Well done oater. It's something of an oddball—a TCF production with typically good production values, an unusual premise, but no marquee names. In fact, screen time is divided between two "heroes", Keith and Jason, neither of whom was a big name at the time. Still, the movie's crowd scenes plus epic location filming suggest an A-production with hopes for a lesser-known cast. It's a big canvas storyline as land rights between an old Spanish land grant and the ambitions of newcomer white settlers clash. Jason certainly looks the part of an aristocratic Spanish padrone, while Keith acts out a low-key gunslinger in usual fine fashion. Each, of course, has a love interest, lovelies Gam and Powers, respectively. Naturally it takes a while for the various conflicting interests to get sorted out, no thanks to the one irredeemable bad guy, Steve Brodie. There are several likable scenes—a charming folk dance among the settlers, along with a very well conceived last scene that serves as a fitting epilogue. I suspect this 1958 release got lost in the waves of Westerns consuming much of TV and movies of the time. I'm sure it was hard to compete with the likes of The Big Country (1958) with Gregory Peck and Charlton Heston that received a ton of promotion. Still, this obscure feature remains a good slice of entertainment, along with some food for thought.